I’m so thankful that finally I was able to sleep. It’s my last day and I decided to do Kayaking before my flight. I woke up and get ready early. The manager of the Inn were I stayed was not yet awake, I had a hard time talking with her staffs. When she finally woke up, she head directly to the phone and tried to call the tour in-charge to pick me up while her staffs were arguing and fighting in front of her about something. It’s weird and awkward seeing two Thai girls physically hurting each other in front of a guest like me. A few minutes passed, the tour service came. It was a relief that I can escape from the drama scene in language I cannot comprehend. The service is small open jeep type car that can accommodate up to 14 people. Though there is a group of Thai friends and a Chinese couple, the rest are Europeans. I enjoyed the picturesque view going to Ao Thalan – the kayaking point. Krabi is a lovely place; it reminds me of some places in Philippines. Since it was my first time and I’m alone, one of the guides accompanied me in the boat. We were a huge group paddling through the scenic lagoon in between rock hills, cave and mangrove forest – home of friendly monkeys (just don’t touch them, they bite). I felt body pain and muscle ache especially in shoulders halfway the stream, making me wish I could go for a Thai massage after. I and two guys from Finland were the only ones who booked kayaking for a half day tour. The tour service drove us back to our designated hotels in a speed like he is in a James Bond movie. Because of that, I was able to pack my things properly aside from a quick shower. I finished in 15 minutes, quick enough; the cab just came when I went to the lobby. Krabi Airport is 30-45 minutes away from Ao Nang Beach. There is a long stretch of queue for checking in however it was still early when I finished. I grabbed a gourmet sandwich for late lunch before heading to the departure area. 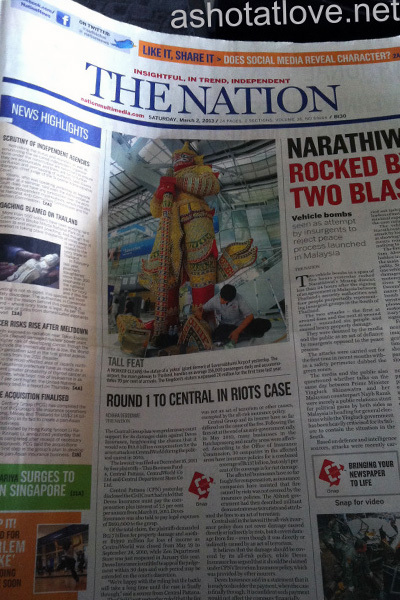 Saw some local newspapers which are ‘The Nation’ and ‘Bangkok Post’ and snatched the materials for a quick read. 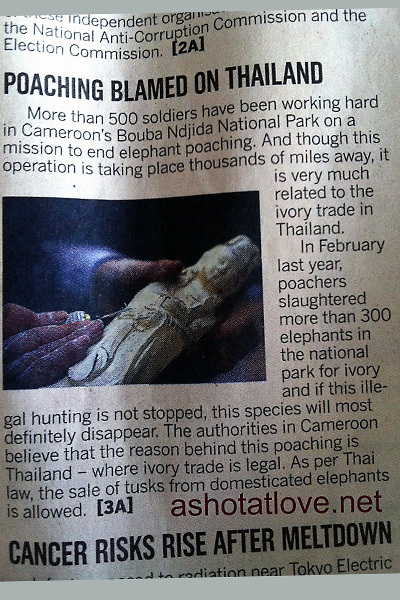 I don’t like the way they write in ‘The Nation’ because of grammatical errors while Bangkok Post is just fine. They published a couple of pages of write up about Jessica Amornkuldilok – winner of Asia’s Next Top Model which is timely for a fashion and featured story. I woke up early for my first underwater photo shoot. I’ve been dying to do this and had been talking with a good photographer Daniel Poh for quite some time now. As a photographer and a person with a regular job, modeling is least on my priority now but I am still willing to do shoots for self fulfillment and to earn. I am not a swimmer and I just tried scuba diving once, I really know the limits of what I can do but I prepare for things I want to achieve. For this shoot I took ounce of guts and practice.